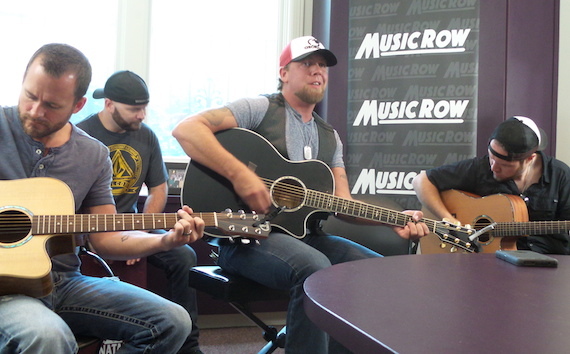 Gunn performs in the MusicRow conference room. Ricky Gunn visited the MusicRow offices recently to perform songs from his full-length debut album King of this Town, including his current single “Livin’ Like Me.” The album was recorded at Nashville’s Blackbird Studio. Gunn’s life changed forever when his grandfather gave him an acoustic guitar and taught him three basic chords. Since then, the Columbus, Ga., native has been honing his craft for more than 16 years, taking it to the next level as a full-time career a decade ago. All the while, he has been climbing toward success, earning opening spots for Travis Tritt, Tyler Farr and Gary Allan, as well as trophies from the Georgia Music Awards, and a spot on the first season of Nashville Star. Gunn plays about 100 dates per year, and was such a hit during the 2015 CMA Music Festival during his performance at Hard Rock Café, the venue invited him back. In fact, that is where he headed right after his visit to MusicRow. His busy touring schedule also helped him earn a sponsorship from 8 Seconds Canadian Whisky, so he brought a bottle to share with the staff. 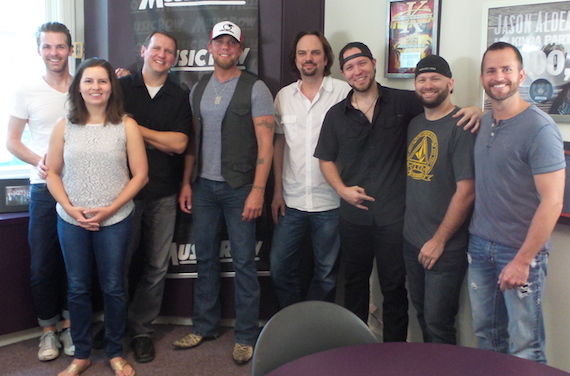 Gunn and his band visit MusicRow staffers.